When it comes to choosing a gift I try to look for things that I know will appeal to the recipient, considering their interests or preferences but some gifts are easy to choose because they are not just beautiful but they carry a deeper meaning. With that in mind can I draw your attention to a couple of things from a cult favourite British brand Aromatherapy Associates ? In Russia candles are part of our culture, we use them at home, like everyone else but we also light them when we go to church. We light them for the ones we love, as well as those that we have sadly lost, while silently saying our prayers & drawing comfort & strength from the burning flame. One of Aromatherapy Associates founding partners, Geraldine Howard, is a cancer survivor and when battling the disease she tried to focus on creating something that will not just help her fight the disease, but draw comfort and strength from as well. 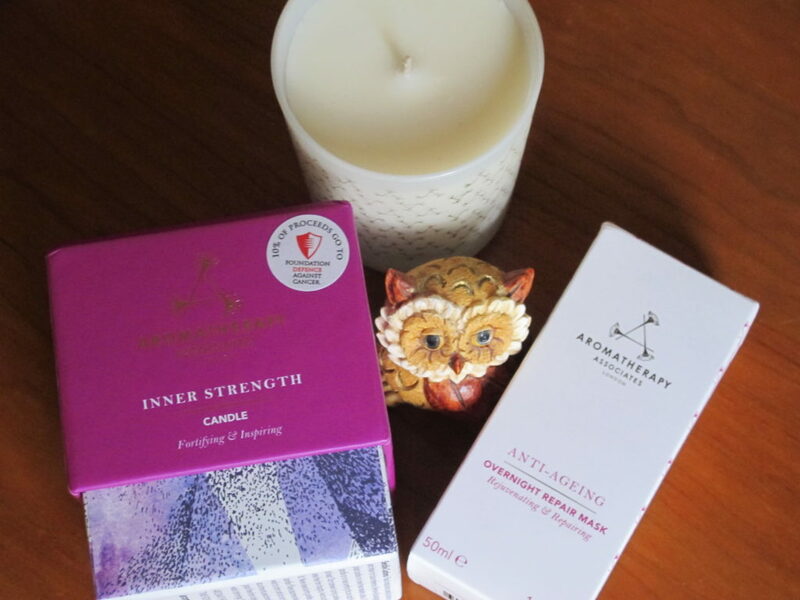 That was how Inner Strength Bath and Shower Oil, followed by Inner Strength Body Oil and this year the range got a new addition, an Inner Strength Candle. When you lift the purple lid you get an instant uplifting smell that somehow makes your feel happy & inspired within seconds – such is the power of aromatherapy ! As you light the candle the space around you starts infusing with the fortifying combination of frankincense and spicy cardamom creating the special ambiance in which you will luxuriate like a cat lying on a sunny patch. The candle’s simple white glass case design embossed with a golden ‘A’ will appeal not just for Christmas but throughout the year. There are a lot of candles on the market that have petroleum residue so it is always worth it to scan the list of ingredients to make sure that your choice is made from soy, beeswax or natural vegetable-based wax. Whether you choose to buy this candle for yourself or gift it to your party hostess or a friend, know that you will bring calmness and strength to them. We never know what is around the corner and when each one of us will need a protective invisible armour of comfort, strength and serenity, so do share this beautiful gift of positivity & calm. Another gift idea that I want to put forward for your attention is the Aromatherapy Associates Anti-Ageing Repair Mask. It’s not new to the market but it comes up in beauty advice conversations as a top favourite from many of the industry’s insiders. If you want to look after your skin properly, introduce a mask into your weekly or twice-weekly routine. Without fail it will reap long-term benefits for your complexion, as well as allow you some ‘me-time’, especially if you don’t have regular facials. The best way to use it is to apply it to your face and neck ( make sure to avoid the eye area ) after exfoliation and leave it on the skin for at least two hours. Better still, leave it overnight and then in the morning just rinse it off with warm water before applying your usual serum, moisturiser or face oil. If the skin feels particularly de-hydrated, apply a face oil and then layer the mask on top, before winding down and going to sleep. Having tried it on myself, as well as some of my friends during a recent movie & PJs party I can report that the skin drinks it like a rose nectar and in the morning you wake up with a fresher, more moisturised complexion, even if you had a late evening the night before. It is also a wonderful product to have in your make-up bad on board the plane, which will make sure that you won’t arrive to your destination looking like a prune.